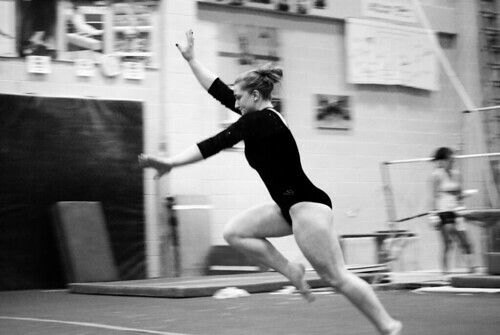 TTN File Photo A member of the women’s gymnastics team prepares to do a handspring in practice last year. The Owls practice 20 hours per week in preparation for their meets. This year’s ECAC Championship will be held at McGonigle Hall. After a promising 2009 campaign in which the women’s gymnastics team finished third in the Eastern College Athletic Conference Championship, the Owls have opened the 2010 season with three Top 5 team finishes versus the likes of Maryland, North Carolina, George Washington and Ursinus. The 2010 version of the Owls features a balance of experienced veterans and youthful depth. Junior Katie Canning and sophomores Corrine Williams and Kaity Watson lead the group. The trio is poised to contend near the top in the all-around in this year’s ECAC Championship. Behind Canning, Williams and Watson, as well as seniors Nina Oteri and Danielle Viens, the Cherry and White opened the 2010 season with a third-place team finish in Maryland Jan. 15, while Williams placed fifth on the vault and third on the floor. Watson scored a 36.325 on the way to fifth place as Temple’s only all-around competitor. Two days later, the Owls finished behind North Carolina at George Washington. The competition also marked the first time Temple has beaten George Washington, who finished in third place, since 1990. Watson improved her all-around score with a 38.000 on her way to a fourth-place finish. Oteri took second place on the balance beam, while Williams tied for third in the event. Sunday, the team traveled to Ursinus in Collegeville, Pa., and placed third with a 188.900 score. Williams picked up the Owls’ first individual honor with a win in the floor competition with a score of 9.700. She also took second on the beam. Freshman Jean Alban finished fifth in the all-around. The Cherry and White have a long way to go until the ECAC Championship, and they know they have to work hard throughout the season. “Physically, they’re ready to go. Now, it’s just a mental battle from here on out. We’re in here 20 hours a week, and we’re pushing every day,” Murphy said. The practice will hopefully help the Owls continue their hot streak throughout the season. But at the end of the day, they still have to put that practice to use and perform well in front of the judges. “You go out there, and you never really know what’s going to happen,” Oteri said. “You train and train and train, but sometimes, it’s just not your day, and sometimes the judges might not be in your favor. “If you go out there, and you do your job, you’re [usually] going to get the results,” Oteri added. Tough matches against Towson, who has won the conference title three consecutive years, and Bridgeport will provide a good measurement of just how good this squad is as it heads into the ECAC Championship. The championship will be held in McGonigle Hall this season and will also serve as the team’s Alumni Day. Murphy said the Owls are excited to host the championship and hope the home-court advantage will help the team improve on last year’s third-place finish. The Owls compete Jan. 27 at Rutgers and host the Liberty Classic in McGonigle Hall Feb. 6. They hope to continue the momentum they have generated from the previous meets for the remainder of the season. Heather Zaniewski places eighth at U.S. Gymnastics National Championship.